Classic Aero-Skin kit from Renwal. 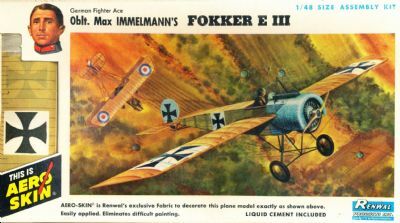 This is their 1:48 scale Fokker E.III and it comes complete in an original sealed box-never opened. Moulded in white plastic with authentic-looking pre-printed tissue covering, this is one of the best in the range.Liquid cement included. Apart from the slightly careworn box, this unique kit is in excellent condition.